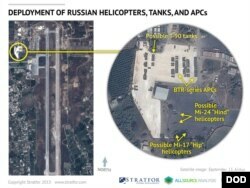 Russia's military buildup in Syria appears to be entering a new phase with the arrival of fighter aircraft. 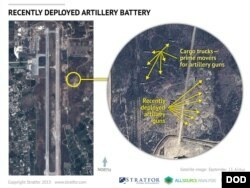 U.S. officials said Friday that Russia had deployed four Sukhoi attack aircraft to an air base near Latakia, along a stretch of coastline still controlled by forces loyal to Syrian President Bashar al-Assad. Eight Russian helicopters, including Mi-24 Hind attack helicopters and Mi-15 Hip transport helicopters, had also been spotted. "Moscow’s ultimate intentions are unclear, but initial signs suggest a focus on providing air support to Syrian forces and to humanitarian relief operations," a U.S. intelligence official told VOA on the condition of anonymity because he was not authorized to speak about the matter publicly. "We would expect Russia to send force protective means, including a small presence of ground forces, to support these operations," the official added. U.S. officials also say Russia now has 500 naval infantrymen on the ground in Syria, with more on the way, and has airlifted enough modular housing units to the air base to support about 2,000 troops. Word of Russia's increased firepower in Syria came just hours after U.S. Defense Secretary Ash Carter spoke to his Russian counterpart for the first time since taking office. A senior defense official said Russian Defense Minister Sergei Shoygu assured Carter that Russia's activities in Syria were defensive in nature and that Moscow was just honoring commitments it had made previously to the Syrian government. Both ministers also agreed to continue talking about "mechanisms for deconfliction," military-speak for finding ways to ensure U.S. and Russian forces do not accidentally engage each other while the U.S. continues its air campaign against the Islamic State terror group and Russia bolsters its backing for forces loyal to Assad. At the White House on Friday, spokesman Josh Earnest defended the resumption of military-to-military contact, which had been cut off following Russia's illegal annexation of Crimea and its involvement in eastern Ukraine. "Our goal here is to pursue this practical cooperation to try to advance the interest of our anti-ISIL coalition and to try to safeguard as much as possible the operations that are underway as a part of that mission inside of Syria," Earnest said, using an acronym for the Islamic State. "We're going to continue to encourage Russia to find a constructive way to support ongoing counter-ISIL operations inside of Syria." Earlier Friday, during meetings in London, U.S. Secretary of State John Kerry told reporters that direct talks with Russia were "an important next step,'' given the worsening crisis in Syria. Until now, U.S. defense officials had been wary of talks with Russia, saying Russia had failed to make its intentions in Syria clear. But some said Moscow's military buildup made talks inevitable. “Russia is going to be part of the conversation because they are making themselves part of the conversation,” a U.S. defense official told VOA on condition of anonymity before the call between the U.S. and Russian defense chiefs. 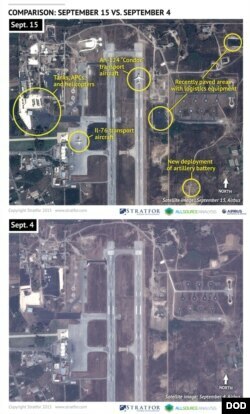 U.S. officials say two Russian Condor cargo planes are landing each day at the Latakia base, bringing in more supplies. Russian cargo ships have also been making deliveries. Videos circulating on social media also claim to show Russian forces operating on the ground in Syria, but the authenticity of the videos has not been confirmed and Syria's foreign minister has denied such reports. A spokesman for Russian President Vladimir Putin said Friday that Russia would consider sending troops to fight if requested. "If there is a request, then within the framework of bilateral contacts, a bilateral dialogue, it will be, certainly, discussed and considered," Dmitry Peskov told Russian news agencies. Analysts say whether or not Russian troops enter the fight on behalf of Assad, he stands to gain. “It gives an aura of stability and even permanency to the Assad regime that it did not have before,” said Christopher Harmer, a former U.S. Navy commander who is now a senior naval analyst at the Institute for the Study of War. Harmer said the Russian military presence could also be enough to change the political reality to suit Moscow's liking. “It essentially completely guarantees that there will be no political solution that involves Bashar Assad leaving Syria for the foreseeable future,” he said. It also comes with risk of entanglement in an already messy conflict. "Maintaining a presence on the ground may require a robust force that could come in direct combat with various forces in the region," a U.S. intelligence official said.